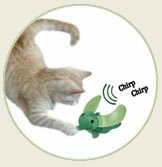 NewCatToys.com - Cat toys, Cat Trees, Cat Furniture, Cat Items, Cat Collectibles, and more! • Instinct is a powerful motivator! - Good old Mother Nature knows what's best. She wants your cat to survive and thrive, so she's built in that enduring need to scratch that is part of being a healthy, happy feline. Scratching is not a character defect -- Scratching is nature's way! Here's why scratching is necessary! • Exercise - Okay, you cats! Dig in those claws! Work and scratch! Pull and tug! Rip and tear! Scratching works muscles and stretches limbs! Whenever he's scratching, your cat is getting a mini-workout from shoulders to back down through the legs and across the chest! • Scent Marking - Special glands in your cat's paw pads release a scent during scratching, so scratching makes home smell like home! Your own home, your workplace, your parents' home, your neighbor's home, EVERY home has its own scent, and even we humans can tell the difference from house to house. Cats have a sense of smell that is far superior to ours! Your cat LOVES the comforting, familiar smell of his own scent throughout his home. Two purposes are served here: (1) a cat's feelings of well-being and security are reinforced, and (2) your cat's place in this world is fortified against intruders! This second point is incredibly important to a cat! Read about cats and territory. • Visual Marking - You realize, of course, that your shredded-up, scratched-up, tattered couch is something you and your cat each see very differently! You see it as an ugly eyesore ... a disappointment ... damaged goods! Your cat, however, sees every rip and snag as a visible sign that she resides here -- that this is her territory. And the more visible, the better. Such a mark is proof of her claim to the property. This mark tells others to respect her place in the world. Again, this is instinct at work, and you just aren't going to convince her that she doesn't need to do this. In her mind, setting up a territory marker is a serious responsibility! Respect for territory is fundamental. Period. This is the feline way of life. Let's compare and contrast a cat with a dog, for the sake of illustrating this key point. Dogs respect social order; there is a chain of command in the world of a dog. Mother Nature designed dogs for community living; one dog emerges on top to lead the pack, and the others contribute to the survival of the group from their own particular place on the ladder. This is all as it should be for dogs, and if you share your home with a dog, then by all means, make the most of this canine instinct, and set yourself up as "top dog". Domestic cats, however, don't do the "pack thing." For cats, it's all about "my space." Cats are keenly aware of what and where and who is part of their territory. Property, ownership, and boundaries MUST BE staked out, respected, and defended. This behavior is absolutely necessary for the survival in the wild (to establish hunting areas for food and safe places to bear and care for offspring). The feline in your home truly needs that same, secure sense of territory. By the way, cats may not behave and respond like dogs, but they still want and need YOUR love and attention. Your cat accepts and appreciates your presence in his territory. Cats depend on us to nurture their emotional health (with your tender brushing, petting, and even your "conversation") and to interact with them in physical play for exercise and pure, simple fun. Outdoor cats are likely to sink their claws into trees, bark, wooden fence posts, and the like. Indoor cats seem to enjoy scratching up wood door trim, the corners of upholstered couches and chairs, wallpapered surfaces or plastered walls, cardboard storage boxes, and rugs or carpeted floors. A cat is looking to scratch a surface that is going to be firm (rather than fluffed-up, pillowy-soft), but with a little "give", and that has some texture, and that will allow his claws to penetrate a bit so he can do some satisfying ripping as he digs in and pulls back. Super-plush or loopy berber-type carpet are sometimes chosen for scratching, but cats don't usually like to scratch stuff that will snag their claws, causing uncomfortable pulling as they try to draw their paws away. Smooth surfaces, like plastic and vinyl may get licked or chewed on, but they are rarely scratched. Your cat needs to scratch, and you love your cat, but you don't want ragged, tattered furniture. What you both need is a compromise. Give your cat a place (preferably several places) where she's welcome to scratch with abandon! This means you need to provide scratching posts, scratching pads, or cat trees that your cat will use and enjoy. • Resist the temptation to put their scratchers out of sight, in out-of-the-way places where your cats rarely venture. Cats want their territory markers to be highly conspicuous! Otherwise, what's the point? • If space allows, put a scratcher in every room, or at least in each room your cat is known to visit every day. • Try to put a scratcher very near your cat's bed and favorite cat-nap spots. Scratching after awakening from a nap is practically universal feline behavior. • Observe your cat! Does he scratch vertical surfaces or horizontal ones? Try to find scratchers that will match whichever position he chooses. • Be wary of purchasing a carpeted scratcher if you are trying to teach your cat not to scratch your carpeted floors. Select a different material like cardboard, wood, or sisal so your cat can be "trained away" from wanting to claw up carpet altogether, whether it's on a scratching post or on your floor. • When you bring home a new scratcher, bring it to your cat's attention by using a toy of some kind. For instance, drag a heavy shoelace across the scratcher or use fragrant catnip to entice your cat to approach. You love your cat, and you can understand her desire to scratch, but you want to prevent the destruction of your furniture. Provide alternate scratching surfaces, and take the time to teach your cat to use them. • When you bring home a new scratcher, don't grab her paws and place them onto the scratcher. Your cat knows instinctively how to use her claws for scratching. No one has to teach her this. Forcing her up to the scratcher could generate distress and fear. • If you want to deter your cat from continuing to scratch your furniture, try covering her previously-scratched areas with plastic wrap or double-sided tape. Aluminum foil works well, also. • Pet repellents that have minty or citrus-y smells are often very effective. Cats find those smells to be rather offensive to the feline nose. Make sure you keep applying the repellent every day for a week or two so that the smell stays fresh and the effect doesn't wear off until your cat has come to believe that your couch is going to smell "awful" forever! Yuck! Then, you can switch to applying the repellent about once a week. • Don't strike or physically harm your cat as punishment for scratching your couch. Sure, you're very, very frustrated, but hitting your cat or yelling and screaming at him is going to confuse him, make him anxious, and possibly cause him to mistrust you. If it comes down to spritzing him with a water sprayer or making a sudden noise to deter his scratching, then be sure to employ those tactics during the moment he is caught in the very act. Don't do it as he is walking toward the forbidden couch, and don't do it after he has completed his scratching and is on the move away from the couch. • Don't declaw your cat. There's no need to resort to surgery when there are so many nifty scratching alternatives out there these days. Find an innovative repellent, try double-sided sticky tape, reward him with praise and/or a treat when he scratches on his pad or tree, and make acceptable scratching places easily accessible to him. Learn how to clip your cat's claws at home. Invest some time in teaching and training your cat. Your cat is worth it! • Declawing means cutting off the toes at the first knuckle. To the nimble feline, who is a creature of grace and agility, taking off portions of her toes can reduce her precious sense of balance. • Declawing, like any surgical procedure, puts a cat at risk for medical complications during and/or after the surgery. • A cat without claws lacks his most effective means of self-defense. Front claws are used to scratch an attacker, and back claws are used to escape attack by climbing a tree or fence. If a declawed cat becomes extremely anxious about his vulnerability, he could resort to biting to compensate. • A cat without claws can never be let outside, given that she has no way to defend herself against a predator or unkind human. Even if you have the best of intentions to keep your declawed cat indoors for the rest of her life, there is always the chance that she could find her way outside through some accident or unexpected turn of events. • Scratching is instinctive. It's a natural and healthy behavior. • Cats need to scratch to exercise, mark territory, and hone claws. • You can and should train your cat to scratch something besides your furnishings. Why it works and why so many cats LOVE 'em! • It's a unique texture in your house. The texture of the Cat Claws Scratching Pad is unlike any other texture in your home. It's not carpeted, like your floors. It's not covered in any kind of nubby material that could be similar to your couch's upholstery. Your cat won't be confused as to what he should and should not scratch. Your cat can feel that this unique surface is his very own personal place to scratch. • It's loaded with 100% certified organic catnip. Our fragrant, alluring catnip draws cats like a magnet to the Cat Claws Scratching Pad. Cat Claws' organic catnip is the finest available because it's so pure and free of nasty pesticides (so you have complete peace of mind if your cat enjoys licking and ingesting the catnip). There are no fillers, either; our catnip is simply dried leaves and blossoms. • You can put one in every room in your house. Who can afford -- and who has the space? -- to put cat trees in each room of the house? The Cat Claws Scratching Pads are compact and affordable. This makes it so easy to satisfy your cat's urge to scratch anywhere ... anytime ... any place! • It's so satisfying to scratch! The honeycomb-texture material lets claws sink in and do some serious RIPPING! You cat will happily rough it up and scuff it up to send a feline message that "I was here!" Kind of like signing his autograph or carving out some kitty-cat graffiti! (The Cat Claws Scratching Pad actually feels pretty similar to rough tree bark, a favored scratching outlet for outdoor cats!) As the weeks go by, everyday scratching will eventually wear the scratching pad down, and it will need to be replaced. Expect the average cat to need a new one in within a few months -- some cats will scratch harder, and some will scratch more lightly, so there will certainly be variation in the lifespan of the scratching pad. Every now and then, you can sprinkle on some fresh catnip if you want to encourage even more frequent visits to the scratching pad. • Cats will set their hindquarters on one end of the scratching pad (to anchor the scratching pad) and then dig in with their front claws, extending their front paws to reach and stretch while ripping away at the surface of the pad. • A bout of full-body rolling on the scratching pad is a fun activity for lots of cats! Some cats get downright silly and sprawl all over the pad -- a behavior that's probably due to the happy effects of the catnip! • It's common for most cats to scratch for a while and then stop for a rest right on the pad -- sitting in a pose like Egypt's Great Sphinx while leisurely surveying their surroundings. • It is not unusual for cats to climb on the scratching pad and take a nap! Some cats make it their favorite choice for a bed! The Cat Claws Scratching Pad is our top seller -- it's the product that started our whole business! You will find our scratching pad, and several varieties of our popular scratchers when you shop our category of scratchers.